Awards are coming in so constantly, it is hard to keep up with them. In addition to the ones below, we have links from our News page for the Emmy Nominations, etc. Be sure and see the 2002 Emmy nominations for the show. 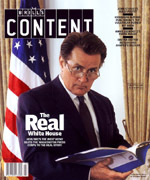 The West Wing won a prestigious Peabody Awards on March 30, 2000 in New York from the University of Georgia's Henry W. Grady College of Journalism and Mass Communication. NBC, John Wells Productions in association with Warner Bros. Television "A magnificent episodic series that depicts the tension and back-room drama of presidential politics with an unusual mixture of maturity and humanity." For Brill's Content to do a story on a fictional television series, well enough the cover story, is quite an honor. Their March 2000 issue is lovely. LOS ANGELES, July 12 /PRNewswire/ -- The winners of this year's HUMANITAS PRIZES were announced today at the Humanitas annual luncheon at the Hilton Universal City and Towers. These prestigious prizes and $130,000 were awarded to those film and television writers whose produced scripts "communicate those values which most enrich the human person." Won three Television Critics Association Awards (July 15 or 16): Best Drama, Best New Program and Program of the Year (information supplied by Robyn). See previous information on the nominations. Tuesday June 6, 2000 - 'West Wing' gets 6 noms from Critics Assn. NBC's White House drama "The West Wing" received six nominations from the Television Critics Association, which bodes well for the new show's fortunes at this year's Emmy Awards, Variety reports. "The West Wing" is nominated by the critics as best drama, best new program of the year and program of the year, while cast members Martin Sheen and Allison Janney and executive producer Aaron Sorkin were nominated for their work. A guide to the 70's series "Kung Fu" is also available (tho not yet designed).